Gantt charts are great for getting an overview of projects (or even processes with multiple tasks that needs to be executed in order). This type of chart was developed in the 1910s by Henry Gantt and it can be used to show dependencies between activities or where you may have bottlenecks. 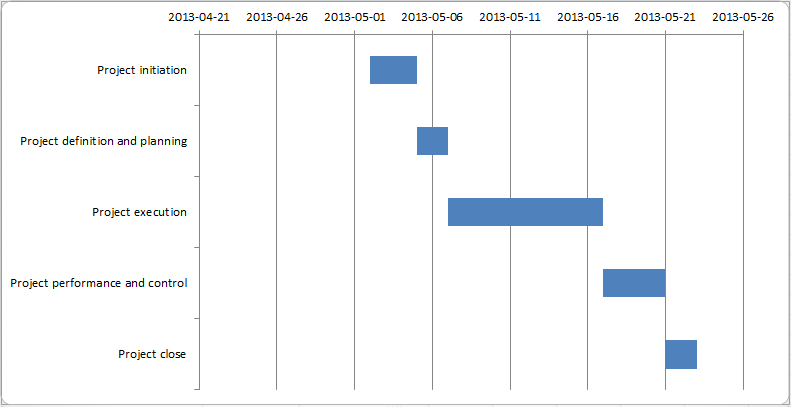 I can recommend the Wikipedia article about Gantt charts if you would like to know more, since this blog post will focus on how to create Gantt charts in excel. Usually you create Gantt charts in project management tools like Microsoft Projects or Ganttr.com, but you can of course also create them in excel (hence this blog post 😉 ). To start we need to have some data and here we have five phases (inspired by Project Management Institute, Inc) with start date and also a duration in days for each phase (you could replace the phases with activities instead if you have a small project). 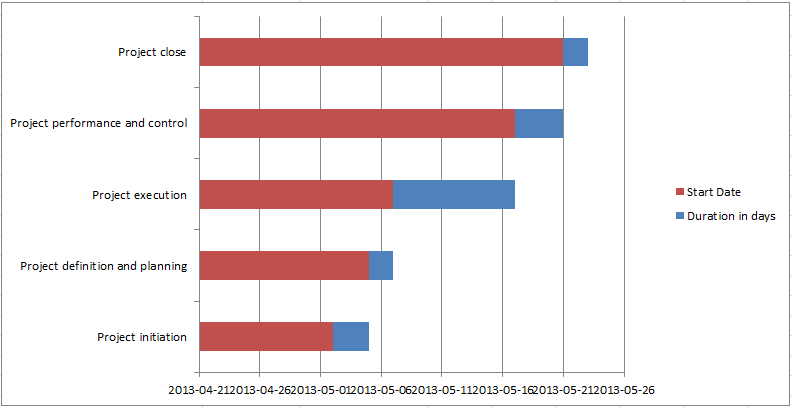 Under the insert tab, select stacked bar chart. Under the Design tab in Chart Tools select “Select Data” to select the data we want to use. Add two series (one for “Duration in days” and a second for “Start Date”). Add the phases or the activities as horizontal axis labels. Reverse the order of “Duration in days” and “Start Date” so you have “Start Date” above “Duration in days”. Here’s the excel file I used in this example if you would like to see how I did this.